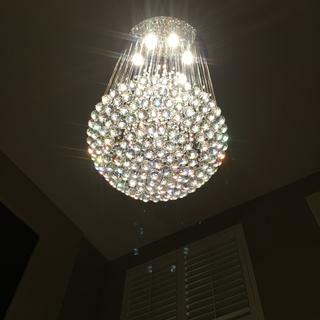 Dramatic floating crystals create a beautiful cascade for this contemporary 7-light chandelier. 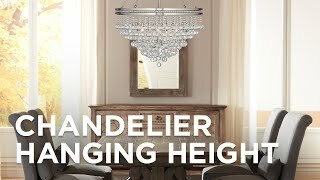 A dramatic addition to a formal space, this 7-light crystal chandelier offers an adjustable height to perfectly for your space. 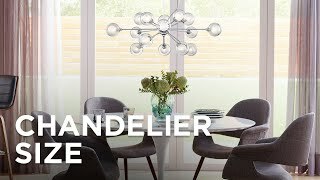 From Vienna Full Spectrum, the chandelier features a chrome finish, round canopy with seven lights. A cascade of crystals underneath creates sparkling, effervescent appeal while ensuring the ultimate in modern luxury. 25" wide x 55" high x canopy is 4 1/2" wide, 1 1/4" thick x weighs 58.74 lbs. Includes 9 1/2-feet of cable; sloped ceiling adaptable. Includes seven 35 watt GU10 bulbs. Chrome finish with clear crystals. 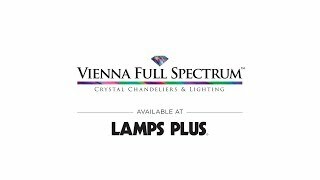 Cita adjustable height floating crystal seven-light chandelier from Vienna Full Spectrum. Is this bright enough ? BEST ANSWER: Hi - with a combined 245 watts of halogen bulbs, this should be enough light for most areas. BEST ANSWER: Hi John - Yes, assembly is required. How do you adjuste the aircraft cable length? Could that be mounted on sloped ceiling (around 45 degree angle) 13ft high? BEST ANSWER: Hi, yes the chandelier can be installed on a sloped ceiling. 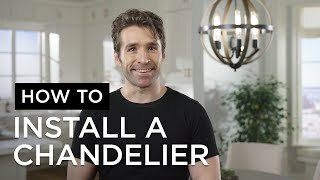 You will have to adjust the support cables accordingly to level the base of the chandelier. No . 13ft High ceiling is not high enough for this type of Chandelier. could it be put on a 12 ft ceiling and wont be to short? BEST ANSWER: If mounting above a table, it will be fine. If under a walkway, this would be too long. 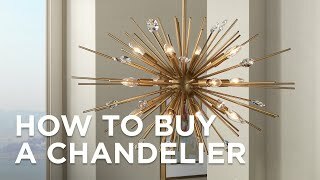 Please feel free to contact one of our knowledgeable Lighting and Home Décor Specialists who can provide you with some fantastic options and advice on choosing a chandelier. It might be too long for a 12 ft ceiling. Could this be put on a regular 8foot ceiling? Can the bulbs be changed? How many lumens total is the output? BEST ANSWER: Hi - this includes 35 watt GU10 bulbs with an approximate 275 lumens each and they can be changed. 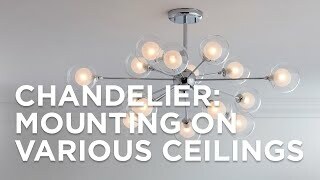 Can this be flush mounted such that the fixture begins at the ceiling? BEST ANSWER: Hi - no, unfortunately this can not be flush mounted to the ceiling. With this design the support cables have to be there, so 55” is the minimum hanging height. Does the 55" H start at bottom of canopy and include the wire portion before crystals begin? BEST ANSWER: The 55 inch measurement is for the fixture alone and does not include the canopy or the wire. 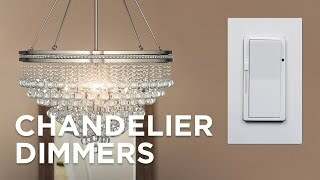 The fixture comes with an additional 9.5 feet of wiring and is completely adjustable. How do U clean these if they are put on a 24 feet ceiling ?? BEST ANSWER: Hi - we recommend a cleaning solution of one part isopropyl alcohol to four parts distilled water in a spray bottle. Spray a small amount of the solution on a white cotton glove or lint free cloth. Wipe the crystal or glass with the damp cloth, and then dry it immediately with another glove or cloth. Work slowly and carefully to avoid damaging any of the hanging glass or ornaments. several ways to clean it-- spray cleaner with a drop cloth under or a long handled duster on a ladder for both methods. What chemicals would u use to spray them- thank u! can this be hung on a slanted ceiling? BEST ANSWER: This fixture could be adjusted to hang on a slope of up to 20 degrees. 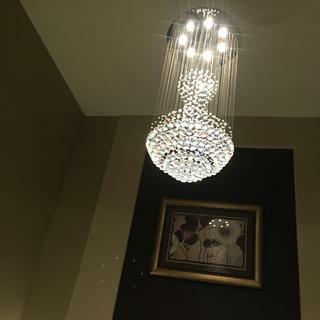 have waited a long time to get this chandelier very happy with the end result looks absolutely beautiful in my hallway . 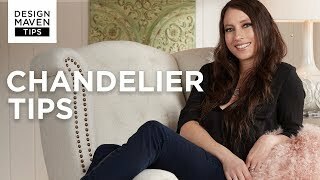 I ordered a total of 8 Chandeliers and all of them are a Show Stopper. Great Conversational Piece.